Colorful, entertaining celebration named to top 100 festivals in the nation by Brand USA brings renowned flyers, kite makers, kite hobbyists, and visitors to Long Beach, on Aug. 20-26. The Washington State International Kite Festival is a free, family friendly event which takes place on a swath of sandy beach, adjacent to a 1/2-mile long boardwalk. Spectators enjoy the colorful happenings of the Washington State International Kite Festival from a 1/2 mile long boardwalk in Long Beach, Washington. 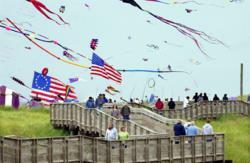 We're very excited about this year’s Kite Festival,” remarked Jane Holeman, event chairman. “With new energy, new attractions and new people...the 2012 event is not to be missed. Featured kite flyers from as far away as Germany and Japan, along with other renowned flyers, kite makers, kite hobbyists, and visitors will meet up in Long Beach, on Aug. 20-26, for the Washington State International Kite Festival. The free-to-watch, family friendly event takes place on a swath of sandy beach adjacent to a 1/2-mile long boardwalk, on southwest Washington’s Long Beach Peninsula. “We're very excited about this year’s Kite Festival,” remarked Jane Holeman, chairman, Washington State International Kite Festival. “With new energy, new attractions and new people including two great featured fliers, as well as old favorites, Team IQuad and 85-year-old Ray Bethell, who flies three stunt kites at the same time, the 2012 event is not to be missed." With the weathered, wooden boardwalk providing an excellent viewing platform, spectators are treated to colorful displays, thrilling competitions, choreographed kite ballets, hands-on workshops, and more. Highlights include a magical, lighted, night fly and mass ascensions with over 250 kites filling the sky at one time. New attractions include kite buggy demonstrations (Tuesday through Sunday) and sky lanterns -- mini hot air balloons made out of paper, which will be launched before Friday’s fireworks display, weather permitting. Featured flyers for 2012 are master kite maker and flyers Mikio Toki (http://mikiotoki.com/english1.htm), from Tokyo, Japan, renowned for his singular Edo-Kaku-Daku, a Tokyo-style, hand-drawn and painted, rectangular kite with multiple bridle lines and a hummer, and Ralf Maserski (http://www.maserski.de), from Dortmund, Germany, who makes and flies graphically bold, brightly colored kites. Named in 2012 by Brand USA as one of the top 100 festivals in the nation, the event, which began as a humble gathering of nine participants and one kite team, has grown into one of the largest kite festivals in North America, attracting thousands of visitors who share a passion for kites and kite flying. The first kite festival in 1981 remains notable; here, a team from Edmunds Community College set (and still holds) the Guinness record for keeping a kite aloft for the longest time, 180 hours. In 1983, the festival began attracting an international audience with flyers from Japan and now hosts flyers from Australia, Italy, England, Indonesia, New Zealand, India, France, Germany, The Netherlands, Brazil, China, and other far-reaching places. For detailed Kite Festival events and a full schedule of activities, please access http://www.kitefestival.com. Long Beach has been called the ‘Kite Capital of the U.S.’ Kite shops, resident kite flyers, and the beloved World Kite Museum provide enjoyment for enthusiasts and first-time flyers alike. A 28-mile long spit of land in the southwestern-most corner of Washington, the Long Beach Peninsula boasts a string of coastal communities with satisfying restaurants, fresh seafood, comfortable accommodations, unique shops, and fine art galleries. Attractions include national and state parks, the Lewis and Clark Interpretive Center, two historic lighthouses, an 8.5-mile paved coastal bike and pedestrian trail, the Willapa Bay National Wildlife Refuge, one-of-a-kind museums, and a 26-mile-long stretch of wide, sandy, public beach. For event and visitor information, please call the Long Beach Peninsula Visitors Bureau toll-free at 800-451-2542 or access http://www.funbeach.com. NOTE: For additional downloadable images of the Kite Festival for editorial use, please contact Carol at 360.481.1752, email carol(at)zahorskypr(dot)com or access http://funbeach.com/press/image-category/festivals-events/. 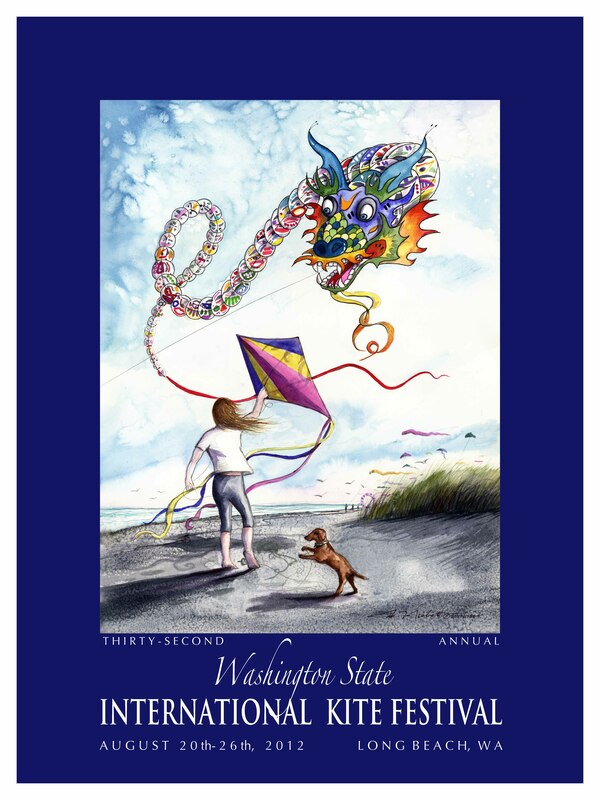 Official poster of the 2012 Washington State International Kite Festival. Artwork by Don Nesbitt.